•	Complete restoration of antique cars. Our experience truly shows itself in the restoration of antique cars. In most cases, we get these cars with little to no interior parts and the true fabricating begins. When starting a restoration project there is a lot of research required to match the original components of the car and re-make them as close to the original as possible. One of our newest restorations was of a 1928 Chrysler Roadster Convertible. 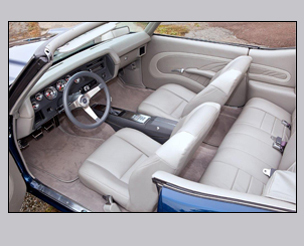 On this job we remade the complete convertible top with fabric to the original frame, installed the rubber floor, rebuilt the seats with burlap and cotton then recovered them with leather. We then re-made the door panels, tire cover with custom logo and finished the rest of the interior to match the original design of the car. The interior was installed using hand hammered upholstery tacks just as the original car was back in 1928. •	Design and fabricate custom street rod and muscle car interiors. This type of work brings a certain type of clientele. Our custom interior customers have specific design ideas that allow and encourage our creativity with less budget restriction then some of our smaller jobs. These jobs are usually brought to us with no original interior so we fabricate the majority of the interior panels, seats and parts. We start with a computer or hand drawn design of the interior and exterior upholstery. Then we fabricate the panels, consoles and frames to the design. After all of the frames are fitted to the interior the parts are formed and trimmed to match the design.